Merry MAGNUS and a happy new year! There is nothing more amazing than seeing hard work pay off, and I couldn't be prouder of my husband and his brilliant filmmaking. MAGNUS, in particular, has become a part of our family. Mad Ruffian (as you may or may not know) is a husband/wife team. Mad (me) (the producer) and my handsome and talented director husband (Ruffian.) When I say Magnus is a part of the family - I do mean it... You see, he is actually a real object - a tool - that sits on the speaker on Ruffian's desk. He probably once belonged to a jeweler (the imaginary likeness of whom inspired the set in the film) and now he holds in his hands an "all access pass" to a festival. He has held many a thing since we met that fateful day at the thrift store when I was shopping for random antiques to put on the tables at our wedding. The original plan for MAGNUS was to make a series of these little films to see in what types of shenanigans MAGNUS might find himself. It turns out that without a render farm, it takes a lot longer than you'd hope to produce even a two-minute film so, if you happen to have one at your disposal and have a few computers to spare (after all, you might as well give up farming for those bit coins as it's close to impossible to get one), we'd be most grateful to use it to render the next couple of installments. 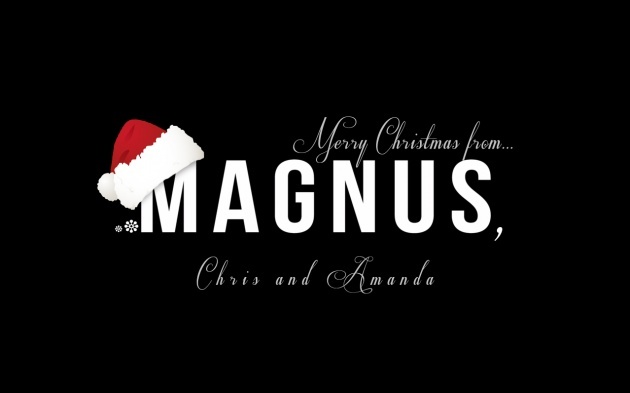 Until then, we aren't sure what is in store for us (or MAGNUS) but, we do know that we wish you the happiest and safest of holidays and a very Merry Christmas from our family to yours.